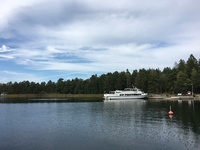 A great cruise on a small vessel ------------------------------------------ In late August through mid September, Karen and I had a delightful cruise of the Baltic Sea region, touring nine stops in seven countries. Our cruise was with a high-end luxury cruise line that specializes in operating small ships with very high crew to guest ratios. 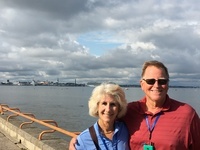 We loved every minute of the trip, including the travel on the glass-smooth Baltic Sea, the exciting low fly-over of the mountainous and glacier-covered Greenland, the education of traveling through Russia and the other Baltic countries, and the warm relationships with formed with both the people native to each country and other travelers. Before we left for the trip we exchanged dollars for Euros (for Germany, Finland, and Estonia), Swedish Kronors, and Danish Kronors. We were out of luck for Rubles, but that did not pose a problem. I think they&apos;ll take anything Western there, but you probably won’t find anything you would want to buy. The Ship - The Silver Wind ----------------------------------- Wow! 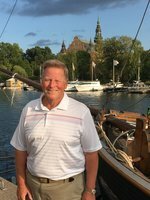 What else can I say about the fabulous tour of the Baltic Sea region aboard the Silver Wind, a ship of Silver Seas. Silver Seas operates a fleet of ten small ships, offering luxury cruises (“World Cruises”) with incorporated tours and also in-depth adventure cruises (“Grand Voyages”). The Silver Wind accommodated up to 294 guests in total with a crew of 222. 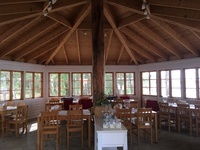 It was built in 1995 and underwent a major refurb in 2018. It will undergo another refurb in 2020 to give the hull iceberg strength for more adventuresome cruising. Captain Fabrizio Rota welcomed us aboard. His crew were from 35 different nations worldwide. Our entire cruise (not including on land tours) was to be 1,295 nautical miles stopping at ten docks in six countries. We were staying on Deck 6 in Suite 641. Our Veranda Suite was 246 ft2, plus a 49 ft2 balcony. Our bathroom had a shower/tub and plenty of room, and we had a walk-on closet with a safe. We had always-on WiFi, 110v power, a fridge. and a great queen size bed. We had a personal butler 24 hours per day, and our butler had an assistant to back him up whenever he was not immediately available. Upon our boarding, he came to the room with our luggage and offered to unpack, and asked what we would like in the room (food, snacks, beverages, ...). We asked that we always have a cold Prosecco in the fridge. Thereafter, for the remained of the cruise, we always had a cold Prosecco. You could wake up at 3:00AM and dial the butler and ask for steak and onion rings, and within a few minutes, it would be served on a white tablecloth in our sitting room. We never did that, but we could have. We did have one meal in our room and it was just as described. The level of service was extraordinary in all aspects of the trip. The butler automatically shined our shoes and if we had laundry, it was taken care of. If we wanted to, there was even a laundry room where we could wash our stuff ourselves. Why? Click here to see what Travel & Leisure magazine had to say about service abord the Silver Wind. Flight and boarding ------------------------- We flew American Airlines Airbus A330-300 Business Class from Philadelphia direct to London Heathrow, where we then boarded a British Airways Airbus 320 to Stockholm. On the first leg, we had a sleeping compartment, which was private and configured to a full-length bed (we flew overnight). We arrived in Stockholm refreshed and ready to tour. See below (1. Stockhom) for our time in Stockholm. The next afternoon, we boarded the Silver Wind to begin the cruise. More about the ship and the amenities --------------------------------------------------- Every morning when we awoke, we had a daily “Chronicle” ship’s paper waiting in a mailbox by our door. It contained the weather, news and description of the day’s activities and tours, a detailed schedule for the day and special instructions for tours, menues, and info regarding the ship’s facilities. Click here for an example. Note that on page 3 of the Chronicles example is a day full of activities for those who wish to stay on board and not tour on land. The ship had everything one could want: multiple restaurants, including the main restaurant (The Restaurant), an exclusive high-end French restaurant (La Dame), barn-to-table Italian restaurant (La Terraza) which doubled in the mornings as a breakfast buffet, a pool-side grill (The Grill) and a bars here and there; a decent-sized heated pool with two spas, a health club; a theater where every evening there was a music or stage play, with a wide variety of venue; a medical facility; concierge and tour desks; a casino; a card room; a botique; and so on. Each day the Chronicles indicated the mode of dress for that evening in the main restaurant, either Formal, Informal, or Casual. The Grill was always Casual, and La Dame was always Formal, and La Terrazza was really what was being indicated. The first night was formal, most of the rest were Informal. I liked having to wear a suit, blazer, or tux to dinner; it lent an air of dignity and special-ness, in my opinion. If that is not your cup of tea, there is always dining available for those in informal dress. In the room, we had a balcony with deck chairs and a table, where we sat throughout the voyage sailing to enjoy the ride, the view, and the Prosecco. 1. Stockholm, Sweden - August 28-29 -------------------------------------------------- We arrived at Stockholm Arlanda Airport at 2:25PM, went through a very non-rigorous customs, collected our luggage, and taxied to our hotel. 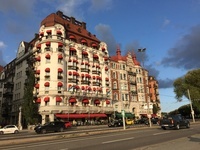 Hotel Diplomat Stockholm is a luxury hotel, located on Strandvägen in the city center of Stockholm. We found it to be in a great location, good facility, and great service. From the hotel, we walked across the street to the docks on Lake Mälaren, which at some point connects to the Baltic Sea. Stockholm is sometimes called “The Venice of the North" because of the wonderful waterways upon which it is built. 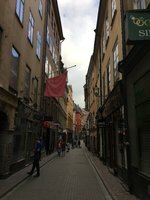 We walked around the city for a while and stopped for dinner at a great cafe, Restaurant Prinsen - on Mäster Samuelsgatan, about five blocks from our hotel. We sat al fresco under their canopy, watching the georgeous people of Sweden saunter by. The were universally tall, blond, well-constructed, and beautiful. Karen even remarked that they were all “10’s”. We ate Kantarell Toast (a pesto of chanterelles over toast), Köttbullar (classic Swedish meatballs), and a Cajun salad with Rakor (salad with shrimp). Of course, we had several classes of Cuvée Madame Chardonnay to accompany. Yumm! A good start to our trip. 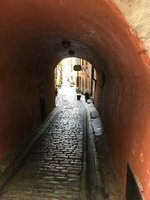 The following morning, we left the hotel after breakfast to tour Gamla Stan, the original old town center located on the island of Stadsholmen and a couple of other smaller islets. It has a lot of cobblestone streets and little shops and some pretty important landmarks. We stopped to look at the Nobel Museum, named for Alfred Nobel, the inventor of dynamite and for whom the Nobel Prize is named. It is located in the old Stock Exchange building on a cobblestone square. We stopped for a coffee on the square to people watch. One gets to and from Gamla Stan over one of a few bridges. We walked over the Vasabron (Vasa Bridge in Swedish), named for King Gustav Vasa (1496–1560) whose statue is nearby. After our tour of the old city and a bit of downtown Stockholm (a delightful place), we taxi’d to the Silver Wind, and began boarding. It was painless, but we needed to get ID cards for the trip and to off- and on-board during the trip. Then we went to our room, met out butler, got settled, went up to the top deck for departure, and viola, we were sailing away for an overnight trip to St. Petersburn, Russia. 2. St. Petersburg, Russia - August 31 - September 1 --------------------------------------------------------------------- Who in America is not curious about life in Russia - its history, its people, its landmarks, it culture, and daily life there? Well, we got to see quite a lot of Russia in two days of touring St. Petersburg. This city was commissioned by Tsar Peter the Great to be a “window looking into Europe’, built on a hundred islands in the Neva Delta (where the Neva River meets the Gulf of Finland). It is the fourth largest city in Europe, and a very interesting one at that. We started by having to enter through Russian security. Since this was a sponsored tour, no visas were required. All other tours, for example private tours, required the complicated and expensive visas to have been acquired long before the cruise began. We boarded the bus for the tour and met our delightful tour guide, a young man named Germain (rhymes with “airman”) who was both knowledgeable and charming. As we drove from the ship to our first stop, we drove through the urban, suburban, and semi-rural landscape. We saw massive numbers of similar big, boxy, unattractive apartment buildings. Germain pointed out that most Russians live in these kind of dull apartments. Typically, an apartment my have an extended family living in just a few rooms, with space at a premium. Karen and I had seen this in other parts of Eastern Europe in places that were formerly a part of the Soviet Union. The Russians seemingly built these big, ugly apartment buildings whereever they went. 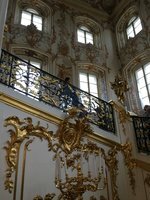 We began with a tour of Peterhof Palace, Peter the Great’s rival to Versailles. An hour drive from the ship, it was built in 1714-25 and remodelled in 1745-55. Though the palace was damaged in World War II by the German advance, it has been carefully restored to its prior glory, and it is truly marvelous. Never have I seen so much gold, inside and out, on walls and statues, on dinnerware and decorations, ... everywhere. It is immense and it is a reminder of a lavish time. 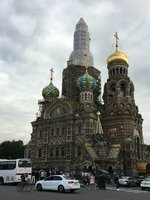 We left Peterhof and went into the heart of St. Petersburg, crossing some of the many bridges and driving by such great landmarks as The State Hermitage Museum. The second-largest art museum in the world, it was founded in 1764 when Empress Catherine the Great acquired an impressive collection of paintings from the Berlin merchant Johann Ernst Gotzkowsky. It holds the largest collection of paintings in the world. We did not tour the museum, though a number of our fellow passengers did so. We stopped at St. Isaac’s Cathedral, with its opulent interior spanning 43,000 square feet and filled with hundreds of impressive 19th century works of art. Featured are the icconostasis of white marble with gold gilding, and the Royal Gate flanked by two lapis columns and ten columns of malachite. The dome alone is guilded by ove 220 pounds of pure gold. St. Isaacs is the most opulent, overly and outlandishly ornate place I have seen, even more so than the Vatican. We stopped and toured the Spilled Blood Cathedral, one of the landmarks of the city. And then we went to the Peter and Paul Fortress, touring it and especially the Peter and Paul Cathedral. The cathedral is the highest building in the city, 404 feet high. It is topped by an angel holding a cross. It is the place where all the tsars were buried after Peter the Great died. The next day we did the “Through the Eyes of Russians” tour, which included a Metro ride, a visit to a Farmer‘s market, and a vodka tasting. Few of us understand the significant political, social, and economic changes that have happened in Russia since December, 1991, when the Soviet Union collapsed. I wanted to see what Russia was like today, so Karen and I opted for this tour. Our first stop was for a lunch at what seemed to be a typical Russian restaurant. 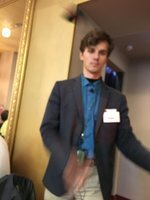 We were served a lunch that was, I believe, ‘westernized” for the benefit of the tour group, but included Russian touches. The place was a little dingy, most of the staff was not unpleasant, but there was no attempt at good cheer. The went through the motions, I believe. Then on we went to the entrance to the Metro. Then things got interesting! First off, the Metro is a hundred meters under the surface. A hundred meters! As we entered the station, we were ill-prepared for what lay ahead. The Metro was began in 1941, but then Germany invaded. 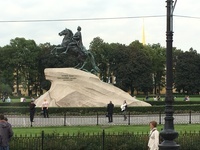 Work resumed after the war and it opened in 1955, linking all five stations in St. Petersburg. We got onto an escalator and rode down a steep incline for a long, long time. Just as the excalator ride ended on a little platform, we stepped forward to another escalator for another equally long ride down. When we stepped off, the station platform was simply amazing. It was perfectly clean, very ornate, and beautiful. This must be one of the best subways in the world. Our guide showed us several parts of the platform system, complete with statues, paintings, and history lessons. At one point, I nudged Karen and whispered, “See that rough looking guy in the crowd? He has been following us and I know he is either a thug or a ‘watcher’, and has military bearing.” I pointed him out to our guide, who ’fessed up that the guy was “security” the cruise hired to watch over us. I was happy that I can still spot a former Spetsnaz in a crowd. We went from St. Isaacs to a Farmers Market, an aspect of the trip I was anticipating. I wanted to see what and how product was displayed and compare what I learned to my experiences at home. Was I disappointed! We arrived at Kuznechny Food Market, where we were supposed to find friendly people and sample some of the food. Not so friendly and no samples, and the place was not particularly clean, nor did the food (meat, produce, dairy, etc) look appetizing. One the other hand, when we walked outside of the market we could clearly see the famed Soviet era Hammer and Sickle on the front of the building. We then walked over to the vodka tasting venue a few blocks away. It was a restaurant and we filled it to capacity. There was a small band playing music and singing, all in a effort to engage our tour. We all played along and had some fun doing it. We were served some canapes and several rounds of “vodka”, each flavored with different spices. I would have preferred some plain vodka and didn’t really enjoy the flavored kinds. But it was an attempt to cater to our tastes in their experience, and all in all, it was a fun time. The servers at this venue were cheerful, as well. Finally, back to the bus and the ship for one of the really good on board dinners. 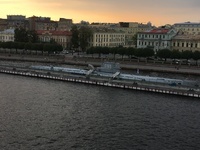 While driving to the ship, we passed a docked Russian submarine (see photo). As we did throughout the trip, we relaxed a bit upon return with some Prosecco, either on our balcony looking over the water, or on the upper deck with friends we met on board. Then dinner and a bottle of good wine. Then some evening entertainment - perhaps a theatrical musical in the theater. Those were done by the working crew, who doubled as entertainers, and they were very good. And at evening end, to bed. Sleeping on board was very easy... it was quiet, dark, peaceful, and smooth. 3. Tallinn, Estonia - September 2 ------------------------------------------- Tallinn, Estonia is located on the Gulf of Finland, directly across from Helsinki, Finland. Since St. Petersburg is on the Gulf of Finland as well, our overnight voyage was on that very placid body of water. 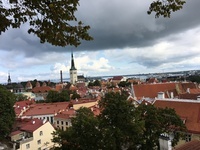 Tallinn is the oldest Northern European capital city, with a rich history - much of which being occupied by a foreign dominators. Starting in 1219, the Danes first, then the Germans, Swedes, and Russians, in an uninterrupted span until the end of World War I (1919). Finally, with Russia in wreckage, Estonia declared its independence, which was then usurped by the Soviet Union just prior to World War II, who (except for three years of Nazi occupation) suppressed all forms of Estonian national pride for the next 50 years. Estonia was finally able to regain independence in 1991 with the fall of the Soviet Union. Finally, the Estonian Parliament charted a path to join the European Union, throwing off the years of Soviet dominance and direction. It has been an EU member since 2004 and in 2009 joined the Eurozone. We were excited to see this little gem of a city. We were driven up the hill from the ship to Old Town, one of the best preserved medieval cities in Europe. The charm is evident everywhere. 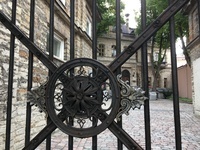 As we walked through Old Town, we passed the gate to the Estonian Parliament - so accessable. We sat on the massive wall surrounding Old Town and viewed the overall city. 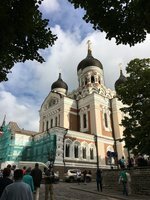 We toured the 19th century Aleksander Nevsky Cathedral, a Russian Orthodox symbol of the centuries of Russification endured by Estonia. 4. Turku, Finland - September 3 ------------------------------------------ We sailed into Turku, Finland on another beautiful day - did I mention the weather we had? We had perfect weather the whole trip: low 60’s to high 70’s, clear skies, calm seas, and sunshine. Great touring weather. I knew something special awaited us as we sailed into this, the 2011 European Capital of Culture, and Finland’s oldest town. It was founded in the 13th century and was Finland’s capital until 1809. At that point it was absorbed into the Russian Federation and the capital moved to Helsinki. It is located on the Aura River, which reaches into the Archipelago Sea. Turku is on the point of Finland where the Baltic Sea, the Archipelago Sea, and the Gulf of Bothnia meet. Just entering the city and the port was a wondrous experience. Sailing boats and ships everywhere along the Aura, the charm of Turku is immediately evident. There are ten bridges in Turku across the Aura in this city of 175,000. The city seems dominated by its large university presence and is a tech center. In 1827, 75% of the city was destroyed by a great fire, so many of the older areas were burned, which affects it history and caused it to be rebuilt at that time. 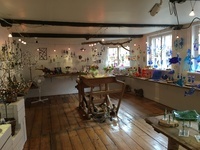 It is a curious mix of old and new, and is a great place to visit and walk. Our first tour stop was at the Orthodox Cathedral. 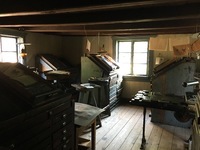 We stopped at a Loustarinmäki Handcraft Museum, which is in reality a village remaining and maintained from about 1775. The entire village is an open air museum, with all the characteristics of the original time. The streets are rough cobblestone, the buildings are well-worn wood and most structures ajoin one-another. Each of the buildings seems to house a business and a home for the owner. There is a printer, painter, tobacconist, etc. Extremely interesting. We toured the fascinating 12th century Turku Castle, the largest surviving medieval building in Finland. 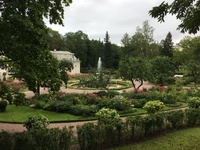 The structure includes the Medieval “keep” (päälinna) and Renaissance “bailey” (esilinna). The keep is a square fort with two square gateway towers with 16 foot thick walls. In the Middle Ages the castle was surrounded by a moat conjoining with the River Aura, the castle effectively lying on an island. We saw many other sights in beautiful and interesting Turku, but we had to leave and return to the ship for another great evening. 5. Västervik, Sweden - September 4 ------------------------------------------------ We were fortunate to embrace the scenic beauty of the Västervik Archipelago from a unique perspective on a local boat ride to Hasselö Island. A local fisherman was our guide on the boat ride as we rode through the archipelago. We landed on the island of Hasselö, population about 36, though it swells to about 500 in the summer. Once primarily a fishing village, it is now focused on tourism, carpentry, and services. Once we landed, we mounted a little wagon pulled by an ATV for our tour of the island. It actually was a great way to see things - we were close, in the open air, and could talk to and hear the local man driving the ATV. He talked to us about the island historically and now, and pointed out great views and local landmarks. He drove us around Hassalö and then over a little bridge to the island of Sladö, population 5. 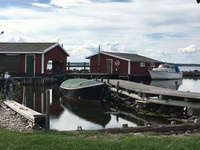 Hassalö has a small cluster of homes, and every house and dock shed on the island is painted barn red with white trim. I guess they all got together and bought the paint. Everything is well kept. When we had finished the tour of the island, we stopped at the restaurant near the dock where the boat that had brought us was docked. We were delighted to have coffee and a delicous cake that the proprietor had made, and as we ate a surprising thing happened. A local man came to our table and asked if he could sit with us and chat. He was, like (apparently) all Swedes, was very fit and handsome, with a great-looking and neatly trimmed beard. He wanted to talk about America, but as a local resident, he was perfectly happy talking about life on the island(s). His wife, a professional, recently came to the U.S. to work, and he would soon be following. He had some questions. During our charming conversation, we learned that he planned to take his hunting rifle to New York so that he could later do some hunting. We warned him about immigrating with a weapon. All in all, it was a great way to meet and learn about the local people. 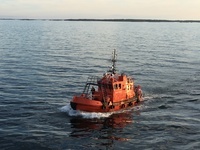 Once we returned to the Silver Wind and it was underway, we were - as usual - sitting on our balcony enjoying a glass of Prosecco, when we saw the red Pilot boat come alongside and the pilot jumped from our ship to the Pilot boat. It was clear that everywhere along the Baltic shores, the archipelagos required the use of local pilots. The 50,000 islands, rocks, and skerries are a navigational hazzard. 6. Rønne, Bornholm and Svaneke, Denmark - September 5 Now I have to confess: just prior to the beginning of the trip I came down with a case of pneumonia. Since it was the weekend, I went to a local clinic rather than my excellent personal doctor, and they gave me some kind of anti-biotic. A few days into the trip, I was still sick and I went to the ship’s doctor, who gave me another. I was feeling pretty weak the day we landed in Roenne, so Karen went on the tour without me. I stayed on the ship, got a massage, hot tub, sleep, and generally slummed. So I missed this particular day, and what I have here is from Karen and the guidebooks. Forgive me. I did well the remainder of the trip, I think. At least Karen didn’t leave me lying in a pool of self-pity on some rock. Back to the trip. Rønne is the largest town on the island of Bornholm in the Baltic Sea, with around 13,000 inhabitants. It is a historic and scenic town, established approximately in the year 1000. It was largely destroyed by Russian bombing of German positions during WW II, but was painstakingly rebuild in its origina tradition. It had early on established itself as a herring fishing village, but over the centuries that declined. The production of ceramics replaced fishing and remains so today. 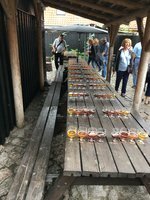 Karen opted for a tour that included Svaneke village and a tasting at the brewhouse. On the way there they was some beautiful shore and forest views, and Karen climbed a forest lookout tower to get a better view. On the way, there as a stop to see an ancient ship hull. She walked through the village and shops, and then went to the Brewhouse where many different beers were set up for tasting. Sounded deligtful to me. 7. Warnemünde (Rostock) and Kuhlungsborn, Germany - September 6 ---------------------------------------------------------------------------------------------- Well, speak of disappointments that turn into pleasures, we learned that our tour booked for this day was cancelled due to the German Bundestag (Parliament) meeting in our expected venue for that day. We had planned to take a train to Berlin, and tour the Brandenburg Gate, Checkpoint Charlie, the Berlin Wall, Charlotten Palace, Kurfurstendam Avenue and the Victory Column in Tiergarten Park, Gendarmenmarkt Square, an exclusive organ recital at the Berlin Cathedral, and capped off with a three-course lunch at the rooftop restaurant on the Reichstag. But, noooo, the German government had business to conduct, so the Reichstag was closed and out tour was cancelled. So, we chose instead to tour the Mecklenburg countryside and the Narrow Guage Railroad. Who knew how much we’d love that day? 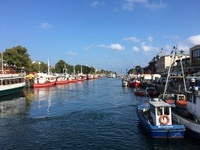 We docked at Warnemünde in what was formerly East Germany, sitting on the estuary of the River Warnow from which it gets its name. 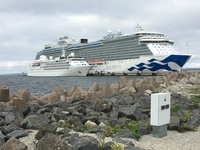 It is a suburb of Rostock, and is a place where many tourist ships dock. We opted for a the “Mechlenburg Countryside and Narrow Guage Rail” tour. A great choice, it turns out. 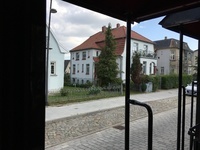 There was, of course, a brief bus ride through the countryside, and then we stopped in Bad Doberan to walk around and find the “Molli”, the name of the narrow guage railroad that runs from Bad Doberan to Kuhlungsborn along the Baltic Coast. What fun. We sat on the train with some friends we made on the cruise and we all had a ball. The train was clean, interesting, open, and was almost like a Disney “Small, Small World” ride, but real. It was build in 1886, and runs around 10 kilometers. Within Bad Doberan the line runs through the street, and later along a linden tree-lined avenue. Between Heiligendamm and Kühlungsborn the tracks run parallel to the Baltic Sea beach across fields. One of my favorite stops on this entire trip was Kuhlungsborn. 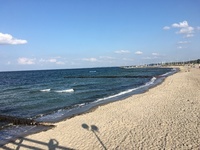 This quaint seaside village with a long white sandy beach on the calm Baltic coast is a very busy resort town whose existence seems to be to make tourists happy. It has a series of great small hotels and wonderful restaurants. We were treated to coffee and cake at a wonderful beachside hotel restaurant. We then walked down to the beach and were entertained by a one-man band, but the real entertainment was the beautiful white sand beaches. It was a wonderful place to be. After a while kibitzing with our friends and enjoying the ambiance, we ambled up the tree-lined lane and down the cobblestone street to view the many shops and restaurants. Were it not for the ever-expected crowds, this would be a great place to spend a summer. 8. Travemunde and Lübeck, Germany - September 7 ---------------------------------------------------------------------- We sailed into Travemunde in what was once West Germany, close to the westernmost edge of the Baltic Sea, almost directly south across the Baltic from Copenhagen. Travemunde is the part of Lübeck that contains the port, being directly on the Baltic. When referring to Lübeck, my understanding is that one is generally including Travemunde. 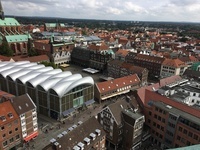 The Hanseatic City of Lübeck (Hansestadt Lübeck) is the largest German port on the Baltic Sea and the second-largest city in Schleswig-Holstein, and is situated at the mouth of the river Trave, giving it the name of its port Travemünde. 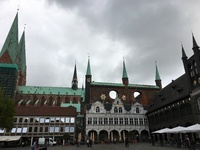 In the 12th century, Lübeck, together with nearby Hamburg (which I have visited for business in the distant past), founded what became the powerful Hanseatic League of ports and trading towns. Unlike fellow Hanseatic Cities of Hamburg and Bremen, it lost its "Free State" status and was incorporated into the German federation. History found a sweeter side for Lübeck - it is globally known for the finest marzipan. The old town (Altstadt) of Lübeck , although considerably damaged during the Second World War, was rebuilt in its medieval times form. It is listed as a UNESCO World Heritage site. The city center&apos;s medieval skyline, mainly composed of seven Gothic-style church towers, is still intact. Lübeck is surrounded by parts of the old city walls with two of the original four city gates left. Most notable is the Holsten Gate (Holstentor) which was the motif on the German banknote of 50 Deutsche Mark prior to reunification, when the bills were redesigned. 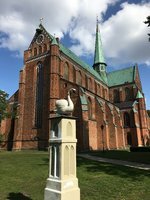 We had joined the cruise’s tours at every stop so far, so this day we opted to conduct our own tour of Lübeck. We started by walking off the boat along the docks into Travemunde to the bus terminal. There we boarded the bus for the brief ride into the old city of Lübeck. 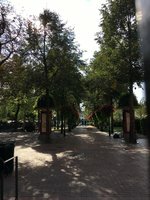 We got off and asked where to pick up the bus for the return trip, and we were told to go to the street by the Holtsen Gate. Okay, we had the schedule and a few Euros. No problem. 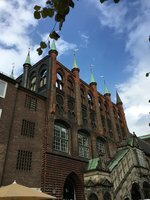 We walked through parts of the old city and quickly found ourselves in front of the Lübeck Cathedral, and next to it the Niederegger Arcade & Square. 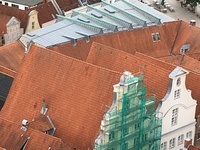 Within the square, we saw the old town hall (“rathaus”) and directly behind it a brewery, with the Cathedral in the background. We sat just outside the Niederegger Arcade across the street from the famous Niederegger Marzipan store and had a cappacino and watched the passersby, just “chillin”. 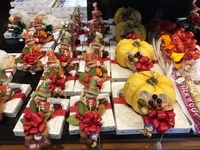 We went into the store, and holy cow, how much marzipan is there? We wondered through the arcade and through the square, and then deeper into the old town, where we happened upon a sign for “observation deck”. It is located in a remodeled St. Peters Church, and the deck is accessed through a combination of stairs and elevators. It gives a great view of the entire old city and across the river to the east (Lübeck old city is an island in the midst of the river). We then began our return to the ship. 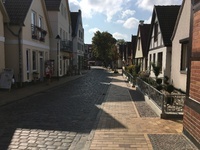 We walked through some of the charming streets loaded with shops (most for the tourists, I believe), and tried to find the bus stop near the Holsten Gate. We stopped several people to ask, and finally a taxi drive pointed out were we could find it. We were a little worried that we would miss it because of the amount of time and walking we expended to find it. But it turned out fine. All aboard and back to Travemunde and the ship. 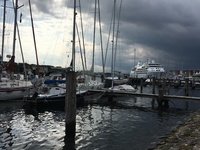 As we walked to the boat from the bus station in Travemunde, we the whole view was a marina on our side of the river, and working docs on the other side. Another wonderful day! Then a glass of Prosecco (what else? ), shower, get presentable, a fine dinner*, followed by another fun musical in the theater. Then we had to face the final sailing sunset of our cruise. Our last night aboard. We joined our friends for a "stone grill" in the Grill, where a very hot stone is placed in front of you and you grill your order. The order can be whatever you like: steak (filet, strip, New York, ...), shrimp, lobster, lamb, and so on, or steak and shrimp or two steaks. When I say whatever, I mean whatever. That and fine wine or other beverage, including specific wines that you&apos;d like. Very upscale all the way. 9. Copenhagen, Denmark - September 8 - 9 ---------------------------------------------------------- The magical ride aboard the Silver Wind was at an end. We had breakfast and our luggage was taken to dockside where we got a taxi and proceeded to the Copenhagen Marriott Hotel for an overnight stay. We were able to tour Copenhagen most of that day and much of the following day. The first stop was while driving to the hotel we asked the taxi driver to stop at the Little Mermaid, an ubiquitous attraction (just below). He then drove us through Amalienborg Slotsplads, the famous square which is home to the Danish royal family. Who knew that for the price of a taxi ride to the hotel, we could get a great little tour and see some sights we may have lost? There were a number of other highlights from that short ride, but our walking tour also included some of them. We checked in and began our walk through Copenhagen. 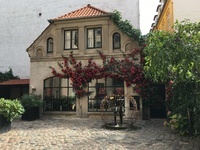 Copenhagen is located on a strait, the Öresund, that connects the Baltic Sea and the North Sea, and which separates Denmark from Sweden. 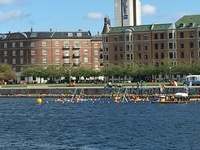 Malmo, Sweden, is just across a narrow part of the Baltic, 26 miles east by road from Copenhagen. 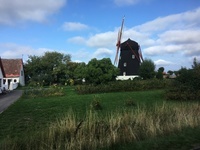 The city, about 1.6 million people, is located on the eastern shore of the island of Zealand, partly on the island of Amager and on a number of natural and artificial islets between the two. Our hotel sat directly on the edge of the Öresund, and gave us a spectacular view of the strait and the part of the city on the other island. 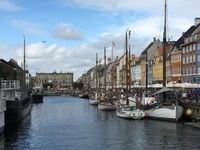 As we walked we came across the spectacular Nyhavn district, a beautiful canal street lined with many shops and restaurants, and all along the canal, bow to stern, small to medium sailing vessels. Absolutely charming. We left Nyhavn (reluctantly) and walked a few block further to the Amilie Garden, where I sat and Karen wandered a bit. I was watching the new Opera house across the strait, a beautiful sight - as are the gardens. 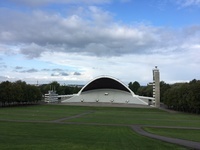 Directly opposite of the Opera view is a look into the Amilienborg square. Amalienborg. The “Slotsplads” is very impressive, with four nearly identical classical palaces (and we are told rococco interiors) around the square and King Frederick V on horseback in the center. We walked over to Amilienborg and witnessed the Queen’s guard on his march to guard her residence palace. 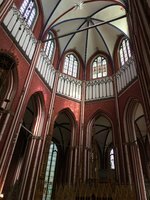 We then walked through the square and came to Marmorkirken, the “Marble Church”, the church of King Frederick V. I sat on the steps for a while, while Karen explored. A couple sat down with me, and we began to chat. They were touring from South Africa, and we compared notes. 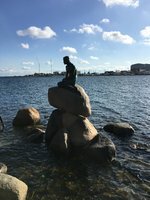 I have to say that Copenhagen was delightful for meeting new people easily and breaking into great conversation. Karen came back and we continued to chat for a while. We decided to taxi back to the hotel (a long, long walk), and as part of the drive, we went trough Kongens Nytorv, a very large pedestrian square. 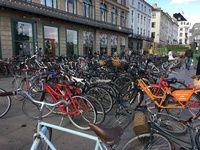 Just near where Hotel D&apos;Angleterra is located, there is a very large bicycle docking station. So many bicycles! We arrived at the Marriott and watched from our window as a fascinating water polo match was played directly in front of our window across the strait in the very cold waters. It was 60 or 65 degree weather, and the water had to be much colder, and they were in the water like it was a heated swimming pool. We asked the hotel concierge to direct us to a good restaurant within walking distance (which is very different for Europeans than it is for Americans), and they pointed us to Restaurant Karla (get Google to translate the page) on Dante Place (“Dantes Plads 1”). 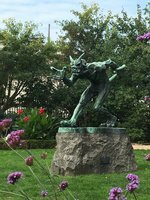 It is directly across from the Ny Carlsberg Glyptotek, a major art museum that holds the collection of the founder of Carlsberg Breweries. The restaurant is small, intimate, and had a very local client base. We each ordered from the prix fixe menu for a fulll-course meal, centered on herring or plaice. It was delicious 10. Iceland and Greenland Flyover ---------------------------------------------- We boarded the Icelandic Air flight home and settled into our Business Class seats. After a stop to change planes in Reykjavik, we flew to Philadelphia and home. 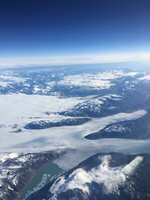 We flewo over both Iceland and Greenland and flew low and got good views. It is ironic that Iceland is green and Greenland is icy. It had been a wonderful trip, one that I would recommend to anyone. But, as always, it was good to be home again. 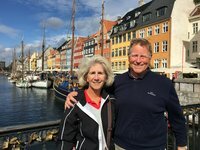 In late August through mid September, Karen and I had a delightful cruise of the Baltic Sea region, touring nine stops in seven countries. 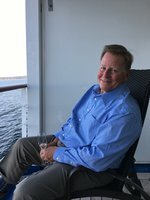 Our cruise was with a high-end luxury cruise line that specializes in operating small ships with very high crew to guest ratios. 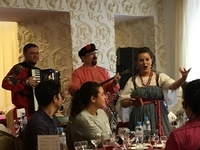 We loved every minute of the trip, including the travel on the glass-smooth Baltic Sea, the exciting low fly-over of the mountainous and glacier-covered Greenland, the education of traveling through Russia and the other Baltic countries, and the warm relationships with formed with both the people native to each country and other travelers. Before we left for the trip we exchanged dollars for Euros (for Germany, Finland, and Estonia), Swedish Kronors, and Danish Kronors. We were out of luck for Rubles, but that did not pose a problem. I think they&apos;ll take anything Western there, but you probably won’t find anything you would want to buy. Wow! What else can I say about the fabulous tour of the Baltic Sea region aboard the Silver Wind, a ship of Silver Seas. 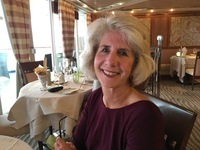 Silver Seas operates a fleet of ten small ships, offering luxury cruises (“World Cruises”) with incorporated tours and also in-depth adventure cruises (“Grand Voyages”). 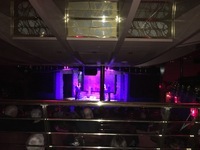 The Silver Wind accommodated up to 294 guests in total with a crew of 222. 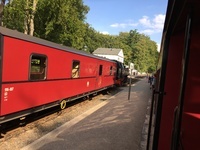 It was built in 1995 and underwent a major refurb in 2018. It will undergo another refurb in 2020 to give the hull iceberg strength for more adventuresome cruising. Captain Fabrizio Rota welcomed us aboard. His crew were from 35 different nations worldwide. Our entire cruise (not including on land tours) was to be 1,295 nautical miles stopping at ten docks in six countries. We were staying on Deck 6 in Suite 641. Our Veranda Suite was 246 ft2, plus a 49 ft2 balcony. Our bathroom had a shower/tub and plenty of room, and we had a walk-on closet with a safe. We had always-on WiFi, 110v power, a fridge. and a great queen size bed. We had a personal butler 24 hours per day, and our butler had an assistant to back him up whenever he was not immediately available. Upon our boarding, he came to the room with our luggage and offered to unpack, and asked what we would like in the room (food, snacks, beverages, ...). We asked that we always have a cold Prosecco in the fridge. 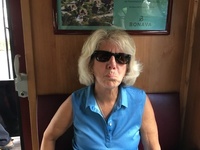 Thereafter, for the remained of the cruise, we always had a cold Prosecco. You could wake up at 3:00AM and dial the butler and ask for steak and onion rings, and within a few minutes, it would be served on a white tablecloth in our sitting room. We never did that, but we could have. We did have one meal in our room and it was just as described. The level of service was extraordinary in all aspects of the trip. The butler automatically shined our shoes and if we had laundry, it was taken care of. If we wanted to, there was even a laundry room where we could wash our stuff ourselves. Why? Click here to see what Travel & Leisure magazine had to say about service abord the Silver Wind. We flew American Airlines Airbus A330-300 Business Class from Philadelphia direct to London Heathrow, where we then boarded a British Airways Airbus 320 to Stockholm. On the first leg, we had a sleeping compartment, which was private and configured to a full-length bed (we flew overnight). We arrived in Stockholm refreshed and ready to tour. See below (1. Stockhom) for our time in Stockholm. The next afternoon, we boarded the Silver Wind to begin the cruise. Every morning when we awoke, we had a daily “Chronicle” ship’s paper waiting in a mailbox by our door. It contained the weather, news and description of the day’s activities and tours, a detailed schedule for the day and special instructions for tours, menues, and info regarding the ship’s facilities. Click here for an example. 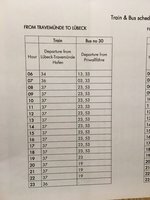 Note that on page 3 of the Chronicles example is a day full of activities for those who wish to stay on board and not tour on land. The ship had everything one could want: multiple restaurants, including the main restaurant (The Restaurant), an exclusive high-end French restaurant (La Dame), barn-to-table Italian restaurant (La Terraza) which doubled in the mornings as a breakfast buffet, a pool-side grill (The Grill) and a bars here and there; a decent-sized heated pool with two spas, a health club; a theater where every evening there was a music or stage play, with a wide variety of venue; a medical facility; concierge and tour desks; a casino; a card room; a botique; and so on. Each day the Chronicles indicated the mode of dress for that evening in the main restaurant, either Formal, Informal, or Casual. The Grill was always Casual, and La Dame was always Formal, and La Terrazza was really what was being indicated. The first night was formal, most of the rest were Informal. I liked having to wear a suit, blazer, or tux to dinner; it lent an air of dignity and special-ness, in my opinion. If that is not your cup of tea, there is always dining available for those in informal dress. 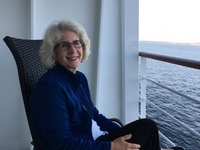 In the room, we had a balcony with deck chairs and a table, where we sat throughout the voyage sailing to enjoy the ride, the view, and the Prosecco. We arrived at Stockholm Arlanda Airport at 2:25PM, went through a very non-rigorous customs, collected our luggage, and taxied to our hotel. Hotel Diplomat Stockholm is a luxury hotel, located on Strandvägen in the city center of Stockholm. We found it to be in a great location, good facility, and great service. From the hotel, we walked across the street to the docks on Lake Mälaren, which at some point connects to the Baltic Sea. Stockholm is sometimes called “The Venice of the North" because of the wonderful waterways upon which it is built. 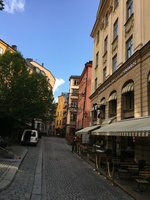 We walked around the city for a while and stopped for dinner at a great cafe, Restaurant Prinsen - on Mäster Samuelsgatan, about five blocks from our hotel. We sat al fresco under their canopy, watching the georgeous people of Sweden saunter by. The were universally tall, blond, well-constructed, and beautiful. Karen even remarked that they were all “10’s”. We ate Kantarell Toast (a pesto of chanterelles over toast), Köttbullar (classic Swedish meatballs), and a Cajun salad with Rakor (salad with shrimp). Of course, we had several classes of Cuvée Madame Chardonnay to accompany. Yumm! A good start to our trip. 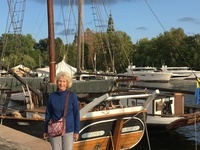 The following morning, we left the hotel after breakfast to tour Gamla Stan, the original old town center located on the island of Stadsholmen and a couple of other smaller islets. It has a lot of cobblestone streets and little shops and some pretty important landmarks. 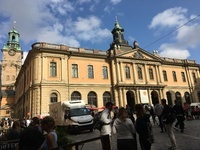 We stopped to look at the Nobel Museum, named for Alfred Nobel, the inventor of dynamite and for whom the Nobel Prize is named. 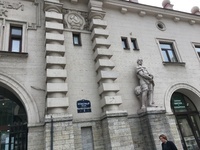 It is located in the old Stock Exchange building on a cobblestone square. We stopped for a coffee on the square to people watch. One gets to and from Gamla Stan over one of a few bridges. We walked over the Vasabron (Vasa Bridge in Swedish), named for King Gustav Vasa (1496–1560) whose statue is nearby. After our tour of the old city and a bit of downtown Stockholm (a delightful place), we taxi’d to the Silver Wind, and began boarding. It was painless, but we needed to get ID cards for the trip and to off- and on-board during the trip. Then we went to our room, met out butler, got settled, went up to the top deck for departure, and viola, we were sailing away for an overnight trip to St. Petersburn, Russia. 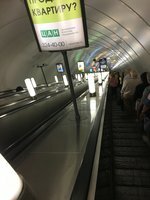 Who in America is not curious about life in Russia - its history, its people, its landmarks, it culture, and daily life there? Well, we got to see quite a lot of Russia in two days of touring St. Petersburg. This city was commissioned by Tsar Peter the Great to be a “window looking into Europe’, built on a hundred islands in the Neva Delta (where the Neva River meets the Gulf of Finland). It is the fourth largest city in Europe, and a very interesting one at that. We started by having to enter through Russian security. Since this was a sponsored tour, no visas were required. All other tours, for example private tours, required the complicated and expensive visas to have been acquired long before the cruise began. We boarded the bus for the tour and met our delightful tour guide, a young man named Germain (rhymes with “airman”) who was both knowledgeable and charming. As we drove from the ship to our first stop, we drove through the urban, suburban, and semi-rural landscape. We saw massive numbers of similar big, boxy, unattractive apartment buildings. Germain pointed out that most Russians live in these kind of dull apartments. Typically, an apartment my have an extended family living in just a few rooms, with space at a premium. Karen and I had seen this in other parts of Eastern Europe in places that were formerly a part of the Soviet Union. The Russians seemingly built these big, ugly apartment buildings whereever they went. 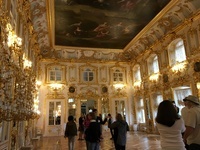 We began with a tour of Peterhof Palace, Peter the Great’s rival to Versailles. An hour drive from the ship, it was built in 1714-25 and remodelled in 1745-55. Though the palace was damaged in World War II by the German advance, it has been carefully restored to its prior glory, and it is truly marvelous. Never have I seen so much gold, inside and out, on walls and statues, on dinnerware and decorations, ... everywhere. It is immense and it is a reminder of a lavish time. 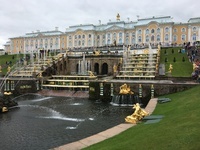 We left Peterhof and went into the heart of St. Petersburg, crossing some of the many bridges and driving by such great landmarks as The State Hermitage Museum. The second-largest art museum in the world, it was founded in 1764 when Empress Catherine the Great acquired an impressive collection of paintings from the Berlin merchant Johann Ernst Gotzkowsky. 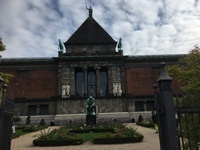 It holds the largest collection of paintings in the world. We did not tour the museum, though a number of our fellow passengers did so. We stopped at St. Isaac’s Cathedral, with its opulent interior spanning 43,000 square feet and filled with hundreds of impressive 19th century works of art. Featured are the icconostasis of white marble with gold gilding, and the Royal Gate flanked by two lapis columns and ten columns of malachite. The dome alone is guilded by ove 220 pounds of pure gold. St. Isaacs is the most opulent, overly and outlandishly ornate place I have seen, even more so than the Vatican. We stopped and toured the Spilled Blood Cathedral, one of the landmarks of the city. And then we went to the Peter and Paul Fortress, touring it and especially the Peter and Paul Cathedral. The cathedral is the highest building in the city, 404 feet high. It is topped by an angel holding a cross. 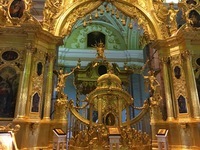 It is the place where all the tsars were buried after Peter the Great died. The next day we did the “Through the Eyes of Russians” tour, which included a Metro ride, a visit to a Farmer‘s market, and a vodka tasting. Few of us understand the significant political, social, and economic changes that have happened in Russia since December, 1991, when the Soviet Union collapsed. I wanted to see what Russia was like today, so Karen and I opted for this tour. Our first stop was for a lunch at what seemed to be a typical Russian restaurant. We were served a lunch that was, I believe, ‘westernized” for the benefit of the tour group, but included Russian touches. The place was a little dingy, most of the staff was not unpleasant, but there was no attempt at good cheer. The went through the motions, I believe. Then on we went to the entrance to the Metro. Then things got interesting! First off, the Metro is a hundred meters under the surface. A hundred meters! As we entered the station, we were ill-prepared for what lay ahead. The Metro was began in 1941, but then Germany invaded. 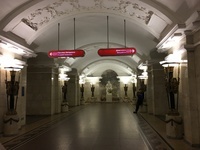 Work resumed after the war and it opened in 1955, linking all five stations in St. Petersburg. We got onto an escalator and rode down a steep incline for a long, long time. Just as the excalator ride ended on a little platform, we stepped forward to another escalator for another equally long ride down. When we stepped off, the station platform was simply amazing. It was perfectly clean, very ornate, and beautiful. This must be one of the best subways in the world. Our guide showed us several parts of the platform system, complete with statues, paintings, and history lessons. At one point, I nudged Karen and whispered, “See that rough looking guy in the crowd? He has been following us and I know he is either a thug or a ‘watcher’, and has military bearing.” I pointed him out to our guide, who ’fessed up that the guy was “security” the cruise hired to watch over us. I was happy that I can still spot a former Spetsnaz in a crowd. We went from St. Isaacs to a Farmers Market, an aspect of the trip I was anticipating. I wanted to see what and how product was displayed and compare what I learned to my experiences at home. Was I disappointed! We arrived at Kuznechny Food Market, where we were supposed to find friendly people and sample some of the food. Not so friendly and no samples, and the place was not particularly clean, nor did the food (meat, produce, dairy, etc) look appetizing. One the other hand, when we walked outside of the market we could clearly see the famed Soviet era Hammer and Sickle on the front of the building. We then walked over to the vodka tasting venue a few blocks away. It was a restaurant and we filled it to capacity. There was a small band playing music and singing, all in a effort to engage our tour. We all played along and had some fun doing it. We were served some canapes and several rounds of “vodka”, each flavored with different spices. I would have preferred some plain vodka and didn’t really enjoy the flavored kinds. But it was an attempt to cater to our tastes in their experience, and all in all, it was a fun time. The servers at this venue were cheerful, as well. Finally, back to the bus and the ship for one of the really good on board dinners. While driving to the ship, we passed a docked Russian submarine (see photo). 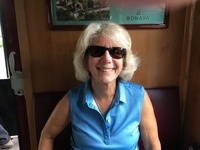 As we did throughout the trip, we relaxed a bit upon return with some Prosecco, either on our balcony looking over the water, or on the upper deck with friends we met on board. Then dinner and a bottle of good wine. Then some evening entertainment - perhaps a theatrical musical in the theater. Those were done by the working crew, who doubled as entertainers, and they were very good. And at evening end, to bed. Sleeping on board was very easy... it was quiet, dark, peaceful, and smooth. Tallinn, Estonia is located on the Gulf of Finland, directly across from Helsinki, Finland. Since St. Petersburg is on the Gulf of Finland as well, our overnight voyage was on that very placid body of water. 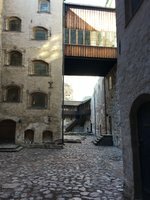 Tallinn is the oldest Northern European capital city, with a rich history - much of which being occupied by a foreign dominators. Starting in 1219, the Danes first, then the Germans, Swedes, and Russians, in an uninterrupted span until the end of World War I (1919). Finally, with Russia in wreckage, Estonia declared its independence, which was then usurped by the Soviet Union just prior to World War II, who (except for three years of Nazi occupation) suppressed all forms of Estonian national pride for the next 50 years. Estonia was finally able to regain independence in 1991 with the fall of the Soviet Union. Finally, the Estonian Parliament charted a path to join the European Union, throwing off the years of Soviet dominance and direction. It has been an EU member since 2004 and in 2009 joined the Eurozone. We were excited to see this little gem of a city. We were driven up the hill from the ship to Old Town, one of the best preserved medieval cities in Europe. The charm is evident everywhere. As we walked through Old Town, we passed the gate to the Estonian Parliament - so accessable. We sat on the massive wall surrounding Old Town and viewed the overall city. 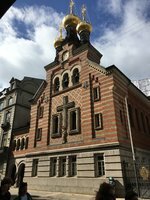 We toured the 19th century Aleksander Nevsky Cathedral, a Russian Orthodox symbol of the centuries of Russification endured by Estonia. 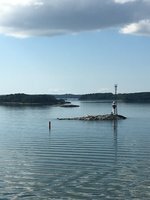 We sailed into Turku, Finland on another beautiful day - did I mention the weather we had? We had perfect weather the whole trip: low 60’s to high 70’s, clear skies, calm seas, and sunshine. Great touring weather. I knew something special awaited us as we sailed into this, the 2011 European Capital of Culture, and Finland’s oldest town. It was founded in the 13th century and was Finland’s capital until 1809. At that point it was absorbed into the Russian Federation and the capital moved to Helsinki. 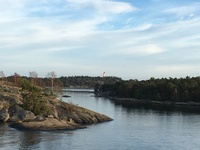 It is located on the Aura River, which reaches into the Archipelago Sea. Turku is on the point of Finland where the Baltic Sea, the Archipelago Sea, and the Gulf of Bothnia meet. Just entering the city and the port was a wondrous experience. Sailing boats and ships everywhere along the Aura, the charm of Turku is immediately evident. There are ten bridges in Turku across the Aura in this city of 175,000. The city seems dominated by its large university presence and is a tech center. In 1827, 75% of the city was destroyed by a great fire, so many of the older areas were burned, which affects it history and caused it to be rebuilt at that time. 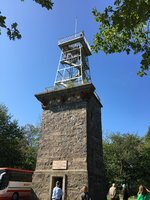 It is a curious mix of old and new, and is a great place to visit and walk. Our first tour stop was at the Orthodox Cathedral. 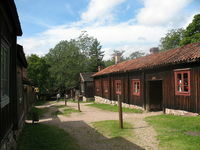 We stopped at a Loustarinmäki Handcraft Museum, which is in reality a village remaining and maintained from about 1775. The entire village is an open air museum, with all the characteristics of the original time. The streets are rough cobblestone, the buildings are well-worn wood and most structures ajoin one-another. Each of the buildings seems to house a business and a home for the owner. There is a printer, painter, tobacconist, etc. Extremely interesting. 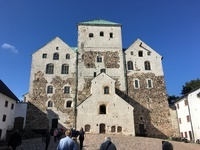 We toured the fascinating 12th century Turku Castle, the largest surviving medieval building in Finland. The structure includes the Medieval “keep” (päälinna) and Renaissance “bailey” (esilinna). The keep is a square fort with two square gateway towers with 16 foot thick walls. In the Middle Ages the castle was surrounded by a moat conjoining with the River Aura, the castle effectively lying on an island. We saw many other sights in beautiful and interesting Turku, but we had to leave and return to the ship for another great evening. 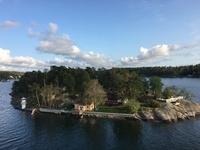 We were fortunate to embrace the scenic beauty of the Västervik Archipelago from a unique perspective on a local boat ride to Hasselö Island. A local fisherman was our guide on the boat ride as we rode through the archipelago. We landed on the island of Hasselö, population about 36, though it swells to about 500 in the summer. Once primarily a fishing village, it is now focused on tourism, carpentry, and services. Once we landed, we mounted a little wagon pulled by an ATV for our tour of the island. 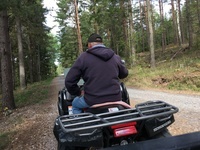 It actually was a great way to see things - we were close, in the open air, and could talk to and hear the local man driving the ATV. He talked to us about the island historically and now, and pointed out great views and local landmarks. He drove us around Hassalö and then over a little bridge to the island of Sladö, population 5. 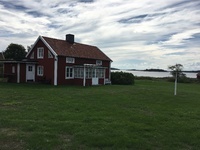 Hassalö has a small cluster of homes, and every house and dock shed on the island is painted barn red with white trim. I guess they all got together and bought the paint. Everything is well kept. When we had finished the tour of the island, we stopped at the restaurant near the dock where the boat that had brought us was docked. We were delighted to have coffee and a delicous cake that the proprietor had made, and as we ate a surprising thing happened. A local man came to our table and asked if he could sit with us and chat. He was, like (apparently) all Swedes, was very fit and handsome, with a great-looking and neatly trimmed beard. He wanted to talk about America, but as a local resident, he was perfectly happy talking about life on the island(s). His wife, a professional, recently came to the U.S. to work, and he would soon be following. He had some questions. During our charming conversation, we learned that he planned to take his hunting rifle to New York so that he could later do some hunting. We warned him about immigrating with a weapon. All in all, it was a great way to meet and learn about the local people. Once we returned to the Silver Wind and it was underway, we were - as usual - sitting on our balcony enjoying a glass of Prosecco, when we saw the red Pilot boat come alongside and the pilot jumped from our ship to the Pilot boat. It was clear that everywhere along the Baltic shores, the archipelagos required the use of local pilots. The 50,000 islands, rocks, and skerries are a navigational hazzard. Now I have to confess: just prior to the beginning of the trip I came down with a case of pneumonia. Since it was the weekend, I went to a local clinic rather than my excellent personal doctor, and they gave me some kind of anti-biotic. A few days into the trip, I was still sick and I went to the ship’s doctor, who gave me another. I was feeling pretty weak the day we landed in Roenne, so Karen went on the tour without me. I stayed on the ship, got a massage, hot tub, sleep, and generally slummed. So I missed this particular day, and what I have here is from Karen and the guidebooks. Forgive me. I did well the remainder of the trip, I think. At least Karen didn’t leave me lying in a pool of self-pity on some rock. Back to the trip. 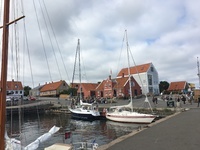 Rønne is the largest town on the island of Bornholm in the Baltic Sea, with around 13,000 inhabitants. It is a historic and scenic town, established approximately in the year 1000. It was largely destroyed by Russian bombing of German positions during WW II, but was painstakingly rebuild in its origina tradition. It had early on established itself as a herring fishing village, but over the centuries that declined. The production of ceramics replaced fishing and remains so today. 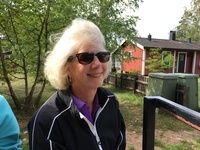 Karen opted for a tour that included Svaneke village and a tasting at the brewhouse. On the way there they was some beautiful shore and forest views, and Karen climbed a forest lookout tower to get a better view. 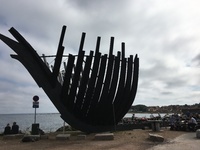 On the way, there as a stop to see an ancient ship hull. She walked through the village and shops, and then went to the Brewhouse where many different beers were set up for tasting. Sounded deligtful to me. Well, speak of disappointments that turn into pleasures, we learned that our tour booked for this day was cancelled due to the German Bundestag (Parliament) meeting in our expected venue for that day. We had planned to take a train to Berlin, and tour the Brandenburg Gate, Checkpoint Charlie, the Berlin Wall, Charlotten Palace, Kurfurstendam Avenue and the Victory Column in Tiergarten Park, Gendarmenmarkt Square, an exclusive organ recital at the Berlin Cathedral, and capped off with a three-course lunch at the rooftop restaurant on the Reichstag. But, noooo, the German government had business to conduct, so the Reichstag was closed and out tour was cancelled. So, we chose instead to tour the Mecklenburg countryside and the Narrow Guage Railroad. Who knew how much we’d love that day? We docked at Warnemünde in what was formerly East Germany, sitting on the estuary of the River Warnow from which it gets its name. It is a suburb of Rostock, and is a place where many tourist ships dock. We opted for a the “Mechlenburg Countryside and Narrow Guage Rail” tour. A great choice, it turns out. There was, of course, a brief bus ride through the countryside, and then we stopped in Bad Doberan to walk around and find the “Molli”, the name of the narrow guage railroad that runs from Bad Doberan to Kuhlungsborn along the Baltic Coast. What fun. 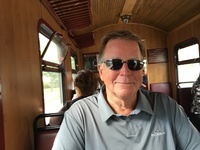 We sat on the train with some friends we made on the cruise and we all had a ball. The train was clean, interesting, open, and was almost like a Disney “Small, Small World” ride, but real. 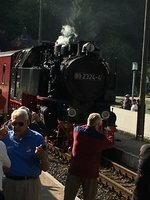 It was build in 1886, and runs around 10 kilometers. Within Bad Doberan the line runs through the street, and later along a linden tree-lined avenue. Between Heiligendamm and Kühlungsborn the tracks run parallel to the Baltic Sea beach across fields. One of my favorite stops on this entire trip was Kuhlungsborn. 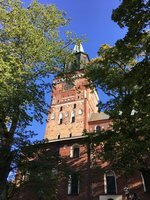 This quaint seaside village with a long white sandy beach on the calm Baltic coast is a very busy resort town whose existence seems to be to make tourists happy. It has a series of great small hotels and wonderful restaurants. We were treated to coffee and cake at a wonderful beachside hotel restaurant. We then walked down to the beach and were entertained by a one-man band, but the real entertainment was the beautiful white sand beaches. It was a wonderful place to be. 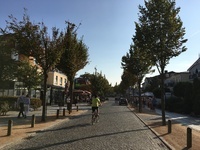 After a while kibitzing with our friends and enjoying the ambiance, we ambled up the tree-lined lane and down the cobblestone street to view the many shops and restaurants. Were it not for the ever-expected crowds, this would be a great place to spend a summer. We sailed into Travemunde in what was once West Germany, close to the westernmost edge of the Baltic Sea, almost directly south across the Baltic from Copenhagen. Travemunde is the part of Lübeck that contains the port, being directly on the Baltic. When referring to Lübeck, my understanding is that one is generally including Travemunde. 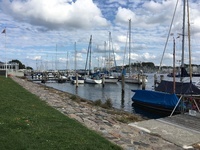 The Hanseatic City of Lübeck (Hansestadt Lübeck) is the largest German port on the Baltic Sea and the second-largest city in Schleswig-Holstein, and is situated at the mouth of the river Trave, giving it the name of its port Travemünde. 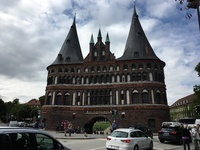 In the 12th century, Lübeck, together with nearby Hamburg (which I have visited for business in the distant past), founded what became the powerful Hanseatic League of ports and trading towns. Unlike fellow Hanseatic Cities of Hamburg and Bremen, it lost its "Free State" status and was incorporated into the German federation. History found a sweeter side for Lübeck - it is globally known for the finest marzipan. The old town (Altstadt) of Lübeck , although considerably damaged during the Second World War, was rebuilt in its medieval times form. It is listed as a UNESCO World Heritage site. The city center&apos;s medieval skyline, mainly composed of seven Gothic-style church towers, is still intact. 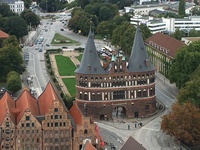 Lübeck is surrounded by parts of the old city walls with two of the original four city gates left. 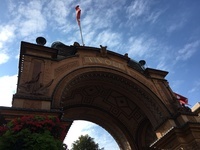 Most notable is the Holsten Gate (Holstentor) which was the motif on the German banknote of 50 Deutsche Mark prior to reunification, when the bills were redesigned. We had joined the cruise’s tours at every stop so far, so this day we opted to conduct our own tour of Lübeck. We started by walking off the boat along the docks into Travemunde to the bus terminal. There we boarded the bus for the brief ride into the old city of Lübeck. We got off and asked where to pick up the bus for the return trip, and we were told to go to the street by the Holtsen Gate. Okay, we had the schedule and a few Euros. No problem. 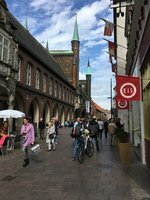 We walked through parts of the old city and quickly found ourselves in front of the Lübeck Cathedral, and next to it the Niederegger Arcade & Square. Within the square, we saw the old town hall (“rathaus”) and directly behind it a brewery, with the Cathedral in the background. We sat just outside the Niederegger Arcade across the street from the famous Niederegger Marzipan store and had a cappacino and watched the passersby, just “chillin”. 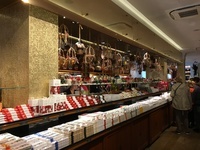 We went into the store, and holy cow, how much marzipan is there? We wondered through the arcade and through the square, and then deeper into the old town, where we happened upon a sign for “observation deck”. It is located in a remodeled St. Peters Church, and the deck is accessed through a combination of stairs and elevators. 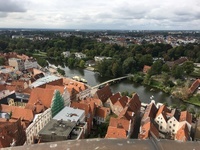 It gives a great view of the entire old city and across the river to the east (Lübeck old city is an island in the midst of the river). We then began our return to the ship. We walked through some of the charming streets loaded with shops (most for the tourists, I believe), and tried to find the bus stop near the Holsten Gate. We stopped several people to ask, and finally a taxi drive pointed out were we could find it. We were a little worried that we would miss it because of the amount of time and walking we expended to find it. But it turned out fine. All aboard and back to Travemunde and the ship. As we walked to the boat from the bus station in Travemunde, we the whole view was a marina on our side of the river, and working docs on the other side. Another wonderful day! Then a glass of Prosecco (what else? ), shower, get presentable, a fine dinner*, followed by another fun musical in the theater. Then we had to face the final sailing sunset of our cruise. Our last night aboard. We joined our friends for a "stone grill" in the Grill, where a very hot stone is placed in front of you and you grill your order. The order can be whatever you like: steak (filet, strip, New York, ...), shrimp, lobster, lamb, and so on, or steak and shrimp or two steaks. When I say whatever, I mean whatever. That and fine wine or other beverage, including specific wines that you&apos;d like. Very upscale all the way. The magical ride aboard the Silver Wind was at an end. 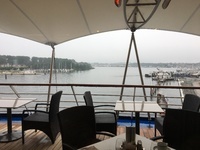 We had breakfast and our luggage was taken to dockside where we got a taxi and proceeded to the Copenhagen Marriott Hotel for an overnight stay. We were able to tour Copenhagen most of that day and much of the following day. The first stop was while driving to the hotel we asked the taxi driver to stop at the Little Mermaid, an ubiquitous attraction (just below). He then drove us through Amalienborg Slotsplads, the famous square which is home to the Danish royal family. Who knew that for the price of a taxi ride to the hotel, we could get a great little tour and see some sights we may have lost? There were a number of other highlights from that short ride, but our walking tour also included some of them. We checked in and began our walk through Copenhagen. 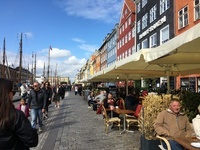 Copenhagen is located on a strait, the Öresund, that connects the Baltic Sea and the North Sea, and which separates Denmark from Sweden. Malmo, Sweden, is just across a narrow part of the Baltic, 26 miles east by road from Copenhagen. The city, about 1.6 million people, is located on the eastern shore of the island of Zealand, partly on the island of Amager and on a number of natural and artificial islets between the two. Our hotel sat directly on the edge of the Öresund, and gave us a spectacular view of the strait and the part of the city on the other island. 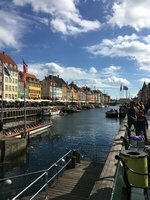 As we walked we came across the spectacular Nyhavn district, a beautiful canal street lined with many shops and restaurants, and all along the canal, bow to stern, small to medium sailing vessels. Absolutely charming. We left Nyhavn (reluctantly) and walked a few block further to the Amilie Garden, where I sat and Karen wandered a bit. I was watching the new Opera house across the strait, a beautiful sight - as are the gardens. 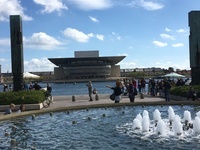 Directly opposite of the Opera view is a look into the Amilienborg square. 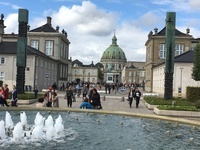 Amalienborg. 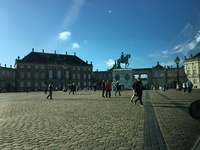 The “Slotsplads” is very impressive, with four nearly identical classical palaces (and we are told rococco interiors) around the square and King Frederick V on horseback in the center. 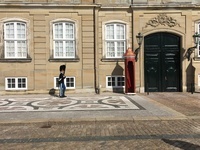 We walked over to Amilienborg and witnessed the Queen’s guard on his march to guard her residence palace. 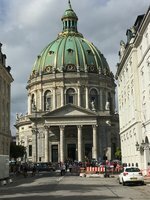 We then walked through the square and came to Marmorkirken, the “Marble Church”, the church of King Frederick V. I sat on the steps for a while, while Karen explored. A couple sat down with me, and we began to chat. They were touring from South Africa, and we compared notes. I have to say that Copenhagen was delightful for meeting new people easily and breaking into great conversation. Karen came back and we continued to chat for a while. We boarded the Icelandic Air flight home and settled into our Business Class seats. After a stop to change planes in Reykjavik, we flew to Philadelphia and home. 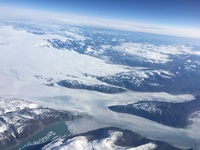 We flewo over both Iceland and Greenland and flew low and got good views. It is ironic that Iceland is green and Greenland is icy. It had been a wonderful trip, one that I would recommend to anyone. But, as always, it was good to be home again. Excellent, overall. We enjoyed sitting on the balcony during cruising.